I can tell buy your words that you like this but since it is not a movie and is a doc. do you think it is worthy of a buy is it something rewatchable or once you seen it you got the info. I suppose "re-watchability" in this case comes down to how big a fan you are of the slasher genre. I can tell you that I myself have watched GOING TO PIECES four times, and I always have a blast with it. It's actually constructed in such a way (rapid cuts, featuring a ton of interviews and clips) that it might require 2 viewings to take it all in. It is certainly a documentary, but I find it an enjoyable piece of entertainment as well. It's got clips of a great many kill scenes, encompassing the classics and the near-classics of the genre, which is another reason I believe it's a film worth seeing more than once. Is it one you'll watch 50-100 times? Definitely not. But I would certainly think you'll go back to it every now and again, just for the points I've laid out above. Hope this helps! Thanks again for stopping by, and for listening to Planet Macabre. I will check this out Dr., not a big documentary fan but I do like the slasher genre. House on Haunted Hill was a very good movie, scary at times. Great job by Price. @Owen: Thanks for stopping by. 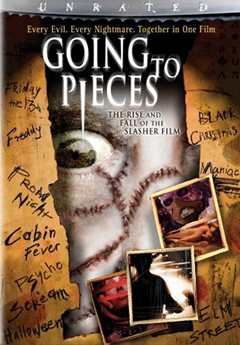 If you're a slasher fan, then you'll definitely find a lot to like about GOING TO PIECES. And I'm glad you enjoyed HOUSE ON HAUNTED HILL. Hopefully, I'll have another good one for you on this week's episode. I'm generally not a slasher film-fan, but this documentary looks intriguing. I may have to hunt a copy down and see what i've been missing out on.